Studio Monitors are the speakers that bring your songs to life in the studio. These will be hooked up to either your Mixing Console or Audio Interface main left and right outputs. Unlike the speakers you might already have in your home, these are meant to deliver a more accurate recreation of the music. In other words, they are meant to reproduce the sound without altering or coloring the tone. Like a good translator during an international negotiation - it's essential that they deliver the message without injecting their own opinions. For this reason the benefits of Studio Monitors are most useful during the Mixing portion of your recording session. 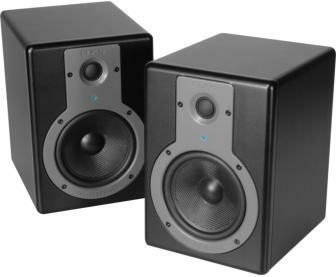 The difference between these and your standard computer speakers can most easily be seen by hearing a song with a high bass output on standard speakers versus out of the monitors. These can get a little pricey (~$300) for a pair, so if money is really tight at first you may want to delay purchasing these until later. As you begin your search, you may run into the terms Far-Field, Near-Field, Passive, and Active. My quick recommendation is to get a pair of Near-Field, Active monitors for your home studio. That will be the best approach for most setups, but in case you fall outside that grouping, here's an explanation of what each one of those terms means. Far-Field studio monitors are intended to be more than ~6 feet away from the listener. These are meant for more of a pro-style acoustically treated studio setup. Or in other words... not for us! Near-Field monitors are what you should focus on. They are designed to be placed less than 6 feet away from the listener. Since they are positioned close to you, they are relatively unaltered by the room acoustics. This is good news for the home studio dweller as our rooms are certainly less than pro-quality. So now we've established that our focus will be on near-field monitors, let's talk about the two flavors: Passive and Active. Both options usually accept either a 1/4" Instrument Cable or a balanced XLR Cable input. Passive monitors require an external power amp and associated cables. These are in general a bit more complicated to properly setup. It's also possible to damage them if you choose a power amp that delivers the wrong power level. You may be able to save a few bucks by going this route, but chances are you'll end up kicking yourself. Unless you already like to dabble in building your own home/car stereo system, I would leave the passive monitors alone for now. Active monitors have their own internal amplification source. They use a standard power plug and are stand alone units. I'd recommend going with active monitors simply because they have all the components pre-matched for you. Basically, this is the easiest and most reliable way to go. It's just one less thing to worry about and any added cost (which really isn't much) is worth having gear you can trust when all is said and done.